For the Ring has awoken…..it has heard its Master’s call! Yes, free folk of Middle earth it is time to wake up and smell the roses. For the roses are beautiful and need to be appreciated. Alas, I was very close to missing them until the Editor cracked me one and I awoke from my slumber. Luckily I saw the shadow of the frying pan as it came flying over the kitchen island. I ducked and it crashed into the fridge. (The Editor has a pretty good arm and aim I might add.) So I woke up pretty quickly! (Sort of like the first line in this post.). Anyway, I was able to get the tickets and it worked out really well. It was a 4:05 start to the game and we were able to watch the game into the 8th inning before we had to go and pick up Georgia. 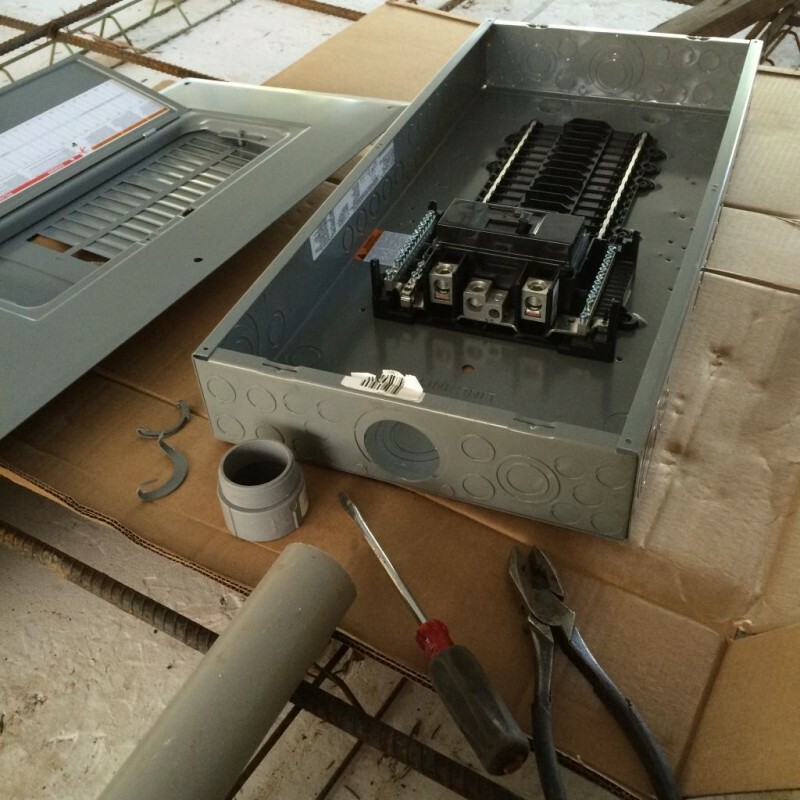 I was also able to get the electrical panel up on the wall Saturday morning so that was a home run so to speak. 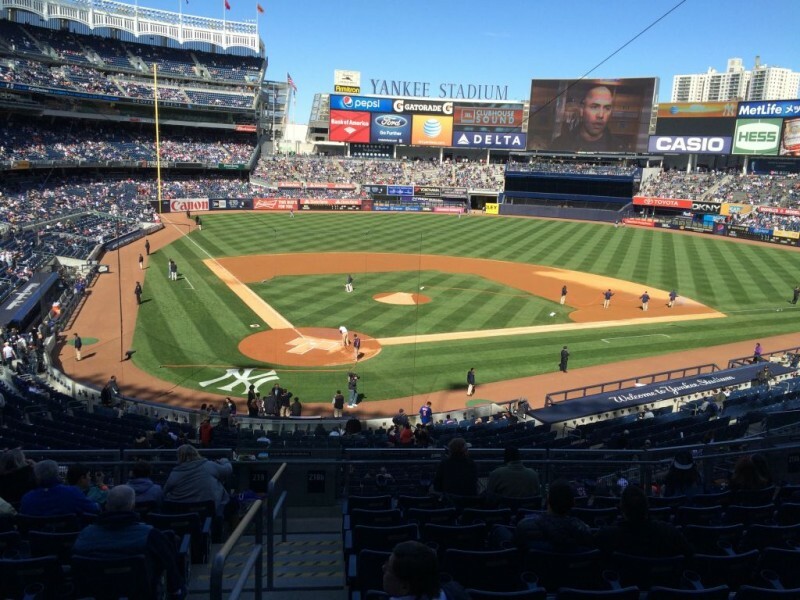 Check out the seats we had. 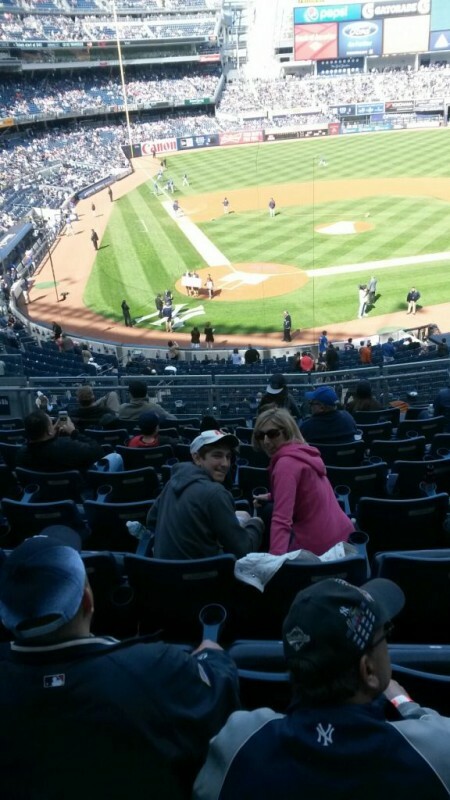 The Editor and Terence at Yankee stadium. 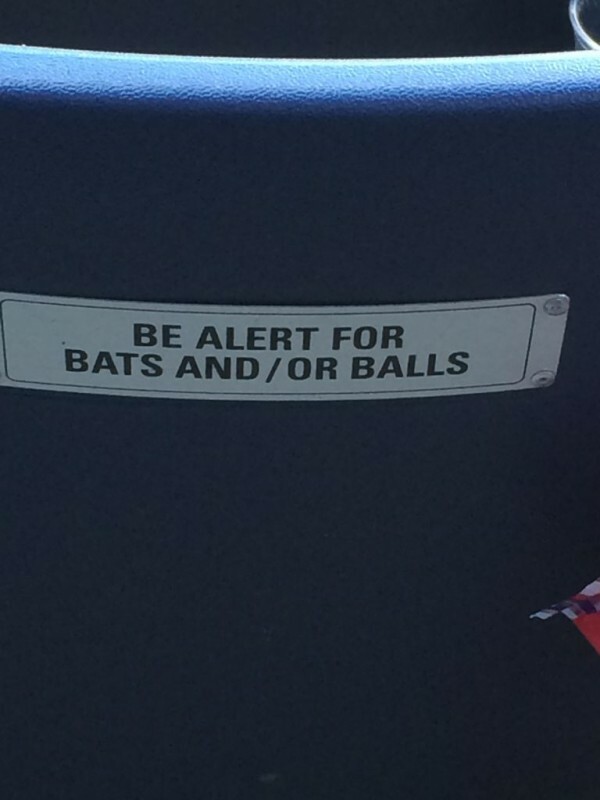 There was a warning sign on the back of the seats in this area though. Check it out. So what’s new at Hobbit Hollow? Well, one of the things that we have to get done before we pour the slab is the odds and ends electrical. I wanted to secure the panel box in the correct location so when we pour everything gets locked into place. Next weekend you’ll see that we’re going to locate all the circuits for the house and bring them over to the panel box. 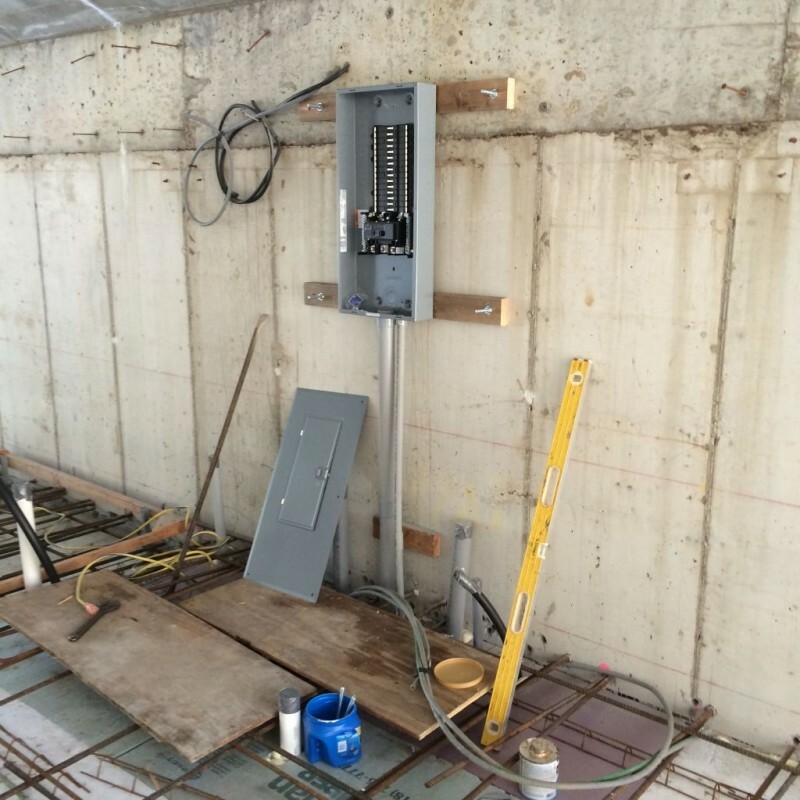 This way the hardest part of the rough wiring will be done when we pour the slab. Another home run! So I picked up a 200 amp service panel at Home Depot and brought it over to the house. I don’t do this kind of work too often so I took my time. I wanted to make sure everything was located properly. It’s a pretty simple procedure. Locate where you want to put the panel, secure it to the wall, and get the conduit into the panel so you can run your main wires into it. I secured a couple of 2x4s to the wall with expansion bolts. Expansion bolts you say? Yes, expansion bolts. Real quick on how they work. 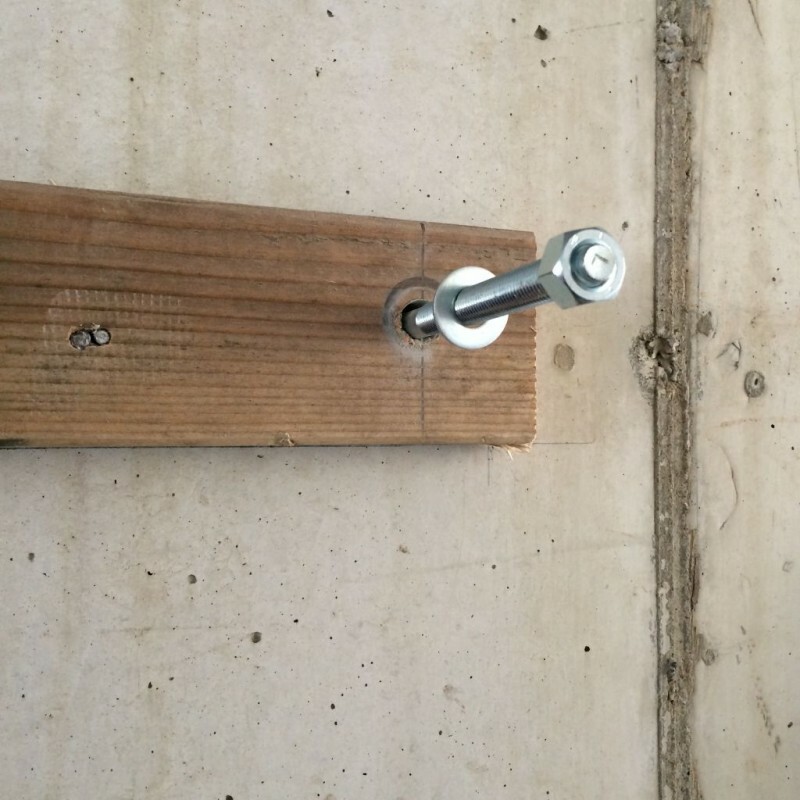 Drill a hole into the concrete at the proper diameter and hammer the bolt in as far as it can go. Once it’s in there and you put the nut on, the bolt starts to pull out of the hole. (Sort of.) As it’s pulling out this piece on the bottom of the bolt starts to expand (Hence the name) and locks it into the concrete. 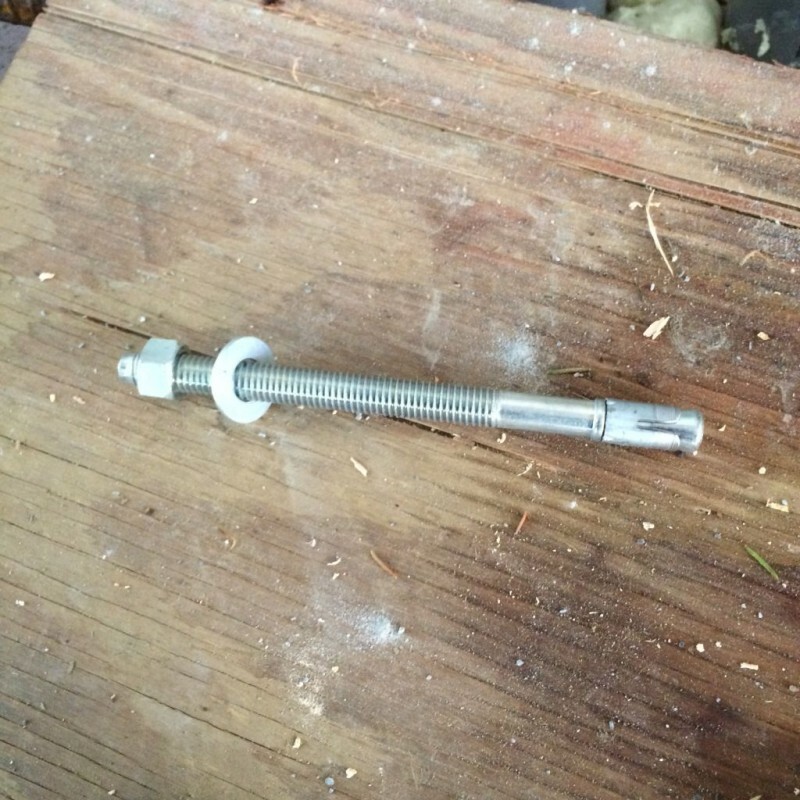 These bolts will never come out once you tighten them up. Actually the more you tighten on the bolt the more they expand, making it impossible for them to come out. Here’s a picture. The bottom is wedged shaped if you look closely. The outer part slides onto that wedge as you crank on the nut. Before you hit the bolt in put he washer and nut on just in case you damage the threads when you hit the bolt. The next thing I did was carefully knock out the opening for the 2 inch pvc pipe in the bottom of the panel. Be careful doing this. I messed this up once and it was really annoying. Knock out the opening at the bottom for the PVC pipe. After that I just cut the pvc to the right height and installed the box on the wall with a couple of drywall screws. That was a wrap for the day. It took me about 2 hours to install it. So I was done just in time to get ready for the game. Oh yeah, like I said, we picked Georgia up at JFK around 7:30. That worked out really well, too. We arrived home a little after 9pm. But this was weird…all of a sudden I smell something in the house. Something that definitely wasn’t there before we left earlier in the day. Sometimes you smell something and you know what that something is but it really isn’t making sense why you are smelling that sort of something. I don’t know if that makes any sense? I asked, “Georgia did you just take off your shoes?” Reply: “Yeah, why?” “Because if you don’t put something on your feet immediately I think I’m going to be sick that’s why!” This was one of those smells that wasn’t just in the air. It felt like it was on you as well. I’m not kidding. It was really bad. She started going on about how she had worn these socks for so many hours on the long flight and blah, blah….Yeah, right. I’m just going to chalk that one up to the English Fish n chips she had across the pond. Its gotta be, right? Needless to say we aired the house out and Georgia washed her feet. She had a grand adventure and she had a tale or two to tell! It was the Fish n Chips right? We’re really going to try and wrap things up next weekend if possible.